Meet the challenge of teaching diverse groups of learners with Leveled Resources! Leveled Lab worksheets help below-level learners with modified and expanded steps, featuring check boxes to track their progress. At- and above-level learners use sheets with the same lab as in the SE with the addition of a Challenge section to engage and extend them. Assessment gives chapter tests written to accommodate all students. Test A, for below-level learners, provides guided questions, such as multiple choice, matching, and fill-in-the-blank completion questions. Test B for on-level learners features short-answer and completion questions. Test C challenges advanced learners with more difficult and open-ended questions. 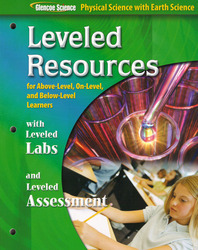 Leveled Resources is a perfect differentiation tool for use with Glencoe Physical Science with Earth Science!